Hi readers! So, you might be a little confused. Today I want to show you some Makeup Geek swatches. 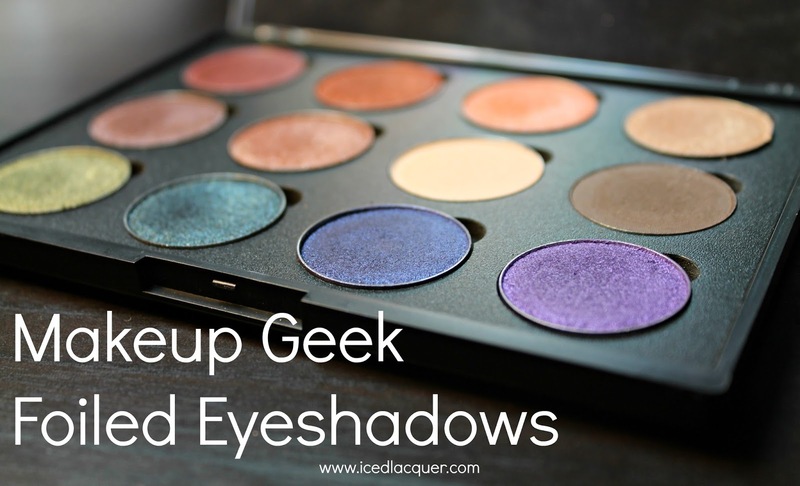 Yes, you read that right, I said Makeup Geek. I usually stick to pictures of nail polish swatches, but I use these shadows SO much that I just wanted to talk about them here. 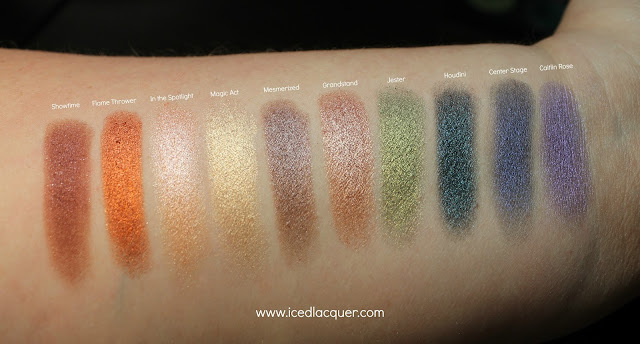 These are the first ten foiled eyeshadows that came out last year and were so thoughtfully gifted to me by my dear friend Courtney! 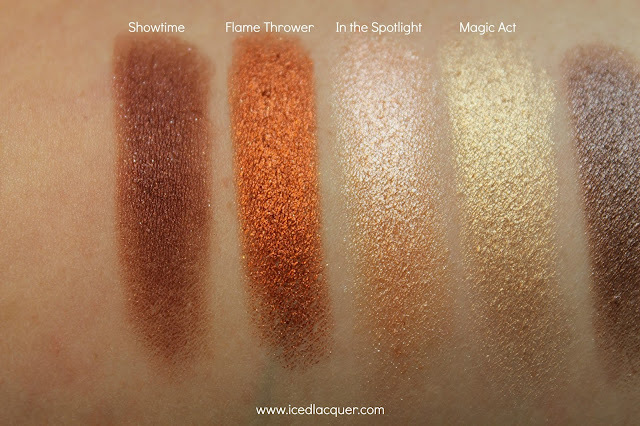 So if you haven't heard of these foiled eyeshadows let me tell you a bit about them. 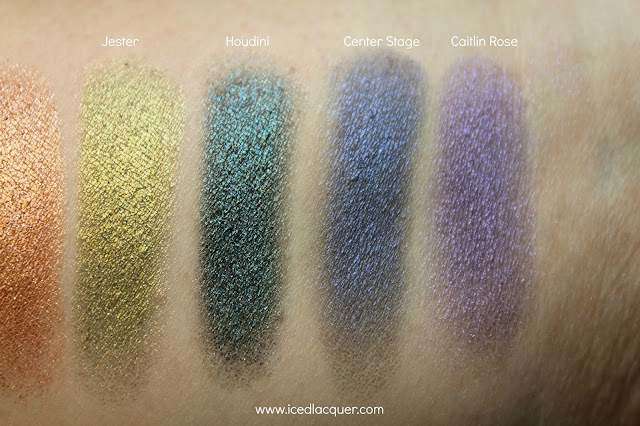 They perform more like a super metallic pressed pigment and give a "foiled" (where you use a damp brush to intensify a metallic eyeshadow) look to the eyeshadow. Seven of these shades are suuuuper buttery and pigmented, but three shades (Showtime, Center Stage, and Caitlin Rose) take a little more work to build up the color and don't look quite as metallic as the others. "Showtime" - A rusty red with tiny silver glitter. "Flame Thrower" - A bright orange with a hint of copper. "In the Spotlight" - A pale peachy rose gold. "Magic Act" - A pale yellow-toned gold. "Mesmerized" - A taupe brown. "Grandstand" - A light bronze. "Jester" - A bright olive green with a hint of gold. "Houdini" - A teal with just a hint of a blue duochrome. "Center Stage" - A navy blue with a hint of purple sheen. "Caitlin Rose" - A cool-toned purple. Most of these just show one swipe of the shadow, with the exception of Showtime, Center Stage, and Caitlin Rose. These were done on bare skin with no primer. The last two (Center Stage and Caitlin Rose) took several additional dips into the pans and swipes on my arm. So yeah! Overall these shadows are absolutely gorgeous and give a really stunning metallic effect. I get a ton of use out of the four more neutral shades in particular (In the Spotlight, Magic Act, Mesmerized, and Grandstand). 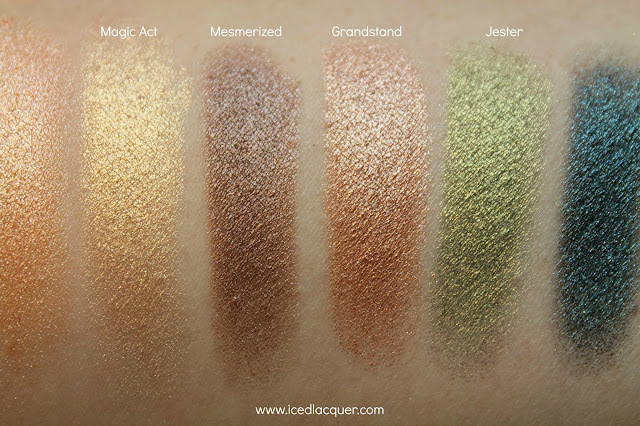 Jester is totally unique in my eyeshadow collection and Houdini has the most illusive but gorgeous shifty quality. Each shadow is available on the Makeup Geek website for $9.99 each! Freaking gorgeous! I actually like how Center Stage comes off somewhat translucent.